Quakers recently attended the annual Luton Peace Walk, a multi faith, multi community event highlighting how the vast majority of Luton's diverse cultures happily co-exist in peace. The walk started at the town hall and went on from there to the Sikh temple. After a while the walk moved onto The Holy Ghost Church for a presentation by St Joseph's Catholic School pupils and then onto the Mosque next door as our final destination. Here's an informal record of the event made by Luton Quakers. Subtitles for the hard of hearing and a full transcript are available optionally within the video and over on You Tube itself. 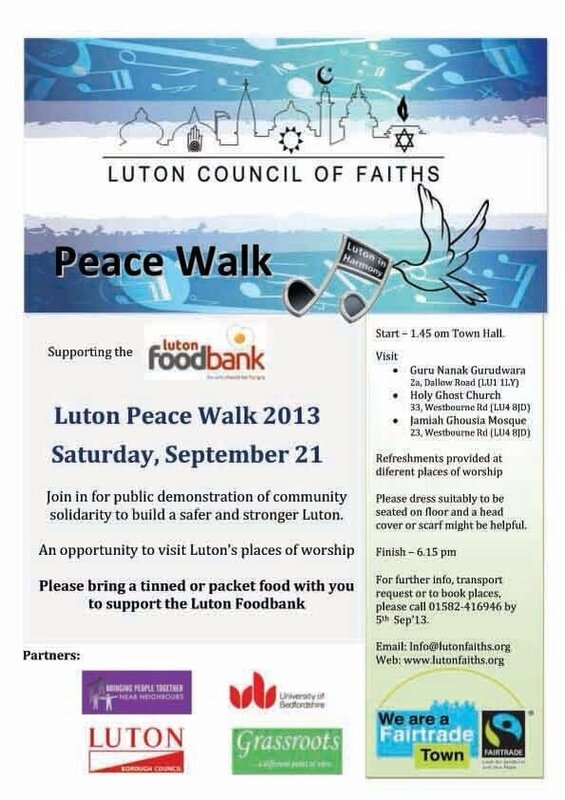 Luton Peace Walk is on September 21st this year.Might still just be time to register.